I list this one as a .351 WSL made in France by Ecole Centrale de Pyrotechnie de Bourges. Is the “2” an indication of month or quarter? Is the (3) stake primer crimp seen only on “17” marked rounds? What is the range of headstamp dates for these French .351s? Can anyone shed light on what French .401 WSL items are out there? Dave … do you by a any chance have TWO of these, one of which you would part with??? Sorry, that would be my one and only! The 2 is for the quarter as in all french military SAA headstamps. Nice! That would make for the earliest headstamp for the series per the info we see here so far. 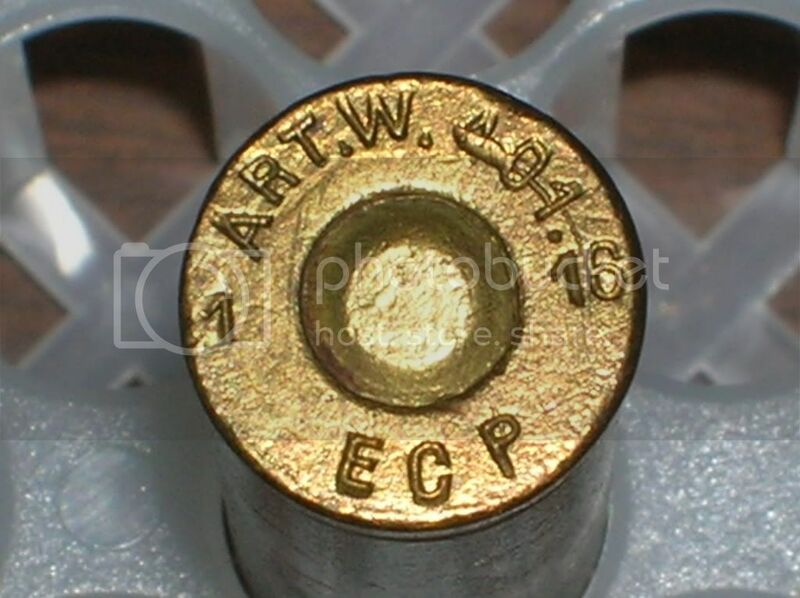 I gotsta know…Does your .401 have primer crimps, and if so, how many? If it’s too much work to look and count them, you could just post a picture…(hee,hee). I would doubt it was tried, as I can’t think of a readily available bullet to use. I guess they could have also necked it to 8mm. comparison. Note the name - 8 x 38 Ribeyrolle. OK, OK…I had an elderly moment! Very interesting post. WWI really was a collision of outdated tactics and modern weapons. “Over the Front” magazine published the reminiscences of a French captive balloon pilot who was armed with a Winchester SLR (caliber not stated) along with a photograph of him aiming the rifle and his drawing of the interior of a basket with the muzzle and cocking rod of his Winchester in view. He actually emptied his rifle at an attacking airplane and then bailed out after his balloon was hit. The ground crew was able to get the balloon back to earth but it burned on the ground. I noted an error in the article; the weight of the .401 SL bullet is given as 7.65 grams (118 grains). In the U.S., this cartridge was only loaded with 200- and 250-grain bullets. Using the drawing in the article, I made some very rough calculations based on an average specific gravity of 10.9 gm/cm³ (Greenhill’s Formula, Hatcher’s Notebook) for a jacketed bullet and by reducing the round-nosed profile to a simple cylinder with a diameter of 10.35mm. A 7.65-gram bullet would be approximately 8.3mm (0.326") long, much shorter than the 18.6mm (0.732") long bullet illustrated. The reproduction is a little fuzzy, so I may be off to the right of decimal. A flat-based 16.2-gram (250-grain) bullet would be about 17.7mm (0.697") in length. A rough calculation for the reduction in weight caused by the base cavity gave about 0.5 grams (8 grains), resulting in a 15.7-gram (242-grain) bullet. Oddly, doubling 7.65 gives 15.3 grams or 236 grains, which goes along with “intended to lighten the projectile” in comparison with the 250-grain bullet. Can anyone shed any light on this one? By the way, what does “ART” in the headstamp stand for? ART = direction de l’artillery (management of the artillery, on which depended the manufacturing of ammunitions before the creation of the service of the equipment) in France until 1918. The Ribeyrolle 8x35 was the idea of M. Ribeyrolle, manager of the Gladiator factory who worked with Chauchat, and Sutter on the CSRG Mle 1915, and later with Sutter only, also the RSG M1917 and RSG M1918 Semi-Auto Rifles…pretty good for a maker of Cars and Bicycles. 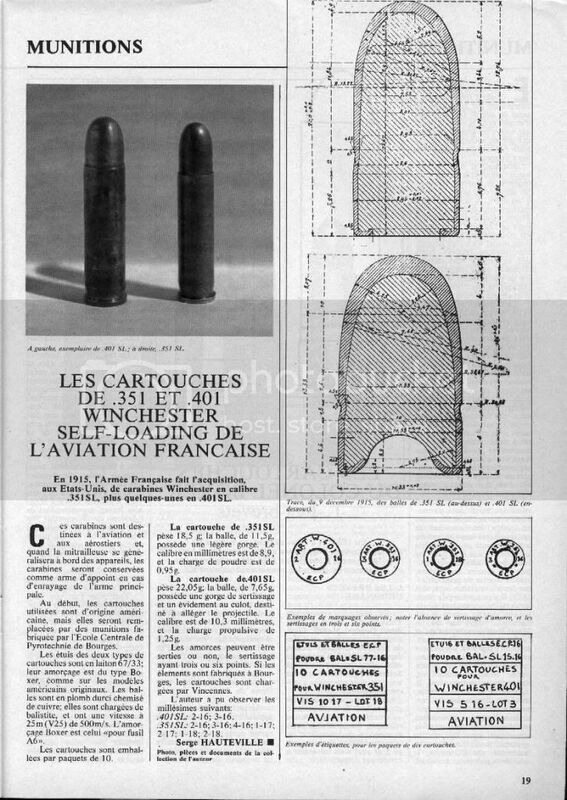 The 8x35 Ribeyrolle cartridge was for a proposed "Trench broom"
fully auto gun ( "an “Assault Rifle”) taking some ideas from the .345 Cal Burton Semi-Auto (USA) which used a Pointed .351 WSL cartridge ( “.345” was the Bore diameter, military style). Nothing much came of the 8x35 Ribeyrolle, but French Archives ( Chatellerault) should have some detailed paperwork on it. They probably used the 8mm Balle “D”, as it was readily available, but a less pointed and lighter bullet would have been an ideal choice for such an advanced cartridge. Are there any examples out there from factories other than ECP? The “Trench Broom” associated with the 8x35 Ribeyrolle looked very modern though my understanding was that it was quite heavy. They said it was rejected because it wasn’t very accurate at 400m! The .401 projectile shown in the drawing provided by pierrejean comes out as about 204 grains/13.25 grams when calculated with a pure copper jacket and a pure lead core. I would guess the nominal weight would be 200 grains. Thanks for posting that Ribeyrolle material. Sure looks like they were close to developing a worthwhile product! As DocAV pointed out, the full weight 8x50R projectile is a little out of place, but maybe it has something to do with the concern over longer range use? Regardless, the 8x35 (and especially the fantasy 8x38 Ribeyrolle I illustrated) if fitted with a 125 grain projectile would be fairly close to the performance of the 7.92x33 and 7.62x39 cartridges that helped usher in the era of the assault rifle about 30 years later.